Woohoo! Nosh Show Monday Already! Episode 14 is upon us and it's a candy drenched doozy as we welcome our second guest to the show, Cybele from candyblog.net. She's literally done thousands of candy reviews so for me it was hard to even know what to ask her in particular. We've also got some candy in our "Nosh or Not" segment. I should have picked something like my beloved Snickers bar for my Nosh of the week, but instead I went with the excellent Cookies 'n Cream ice cream from three twins. Thought #1: Why was blogger messing with my photos? After getting past the third party cookie issue messing with my blogger login, I ran across another problem. Blogger kept changing the white background of my photo uploads to varying shades of grey. It turns out, google+ had decided to "enhance" my photos. To disable it, I had to go to my account settings > google+ > uncheck "automatically enhance new photos" under the Auto Enhance section. Oh, and then go back and re-upload two weeks worth of photos because they all looked funny. Thought #2: Why did I not try this blue tooth audio thing before? So my car is about to turn 11 years old so this is no good there, but my wife's car does have blue tooth audio as an option and it's bloody awesome. I love being able to flip through my playlist or iheartradio stations from the steering wheel, plus it's louder then that foolish audio cable I've been using up til now. Thought #3: Taco Bell Typhoon Freeze any good? I wasn't expecting much, but to be honest, it's not bad. 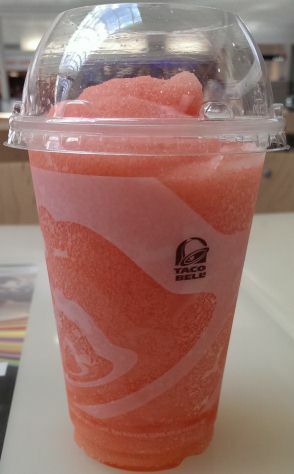 I think the pineapple based flavor should work well with the menu at taco bell, it's just nothing special at all, just a generic ICEE/Slurpee. While I was trying this, GrubGrade was giving the thumbs down to the sour lime flavor (yuck!). This show is just pure hilarity. You four are awesome together, riffing off each other's comments and in general I think enjoying the dialogue. Keep up the great work (my fifth or six show, and I've enjoyed each one).